Gerard Reinmuth will give a lecture at the Barlett in London on Tuesday, January 8. Gerard will present some key built projects from the practice to contextualise a way of thinking embedded in the search for a diverse collection of insights around each project which emerge from a combination of research, intuition, observation and the specific working method adopted for the each project. 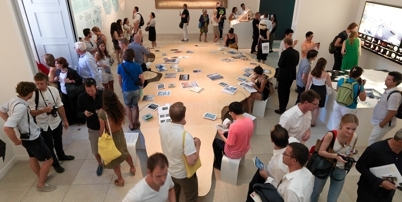 The second half of the lecture will propose how this working method has the capacity to organise very large and complex problems, including the case study of the re-organisation of Greenland – TERROIR’s task for “Possible Greenland”, the exhibition in the Danish Pavilion for the 2012 Venice Biennale of Architecture. This case study raises numerous questions regarding the role of the architect and the limits of the discipline in the face of significant political machinations and - in the case of Greenland - the unresolved business of prior colonisation by Denmark which provoked and ultimately suffocated the project for the 2012 Biennale. Image courtesy of Danish Architecture Centre.